Chocolate Hazelnut Almond Butter is my healthier alternative to that ever-so-popular sugary brand. I made this Chocolate Hazelnut Almond Butter barely sweet. But if you need a bit more sweetness, feel free to add some more honey or even some maple syrup. You can also roast the hazelnuts and remove the skins but those were two extra steps I wanted to avoid to make the process faster. Since this chocolate hazelnut almond butter is made with raw nuts, you’ll just pop everything into a food processor or powerful blender – like a Vitamix – and let it rip. Make sure to scrape down the sides often and be patient. It can take a few minutes for everything to come together. It’s easy to halve the quantities if you’d like to make less. Or, simple double the quantities if you’d like to make more. How Long Does This Chocolate Hazelnut Almond Butter Last? This nut butter will last for a couple weeks, but it’s best when kept in the refrigerator. 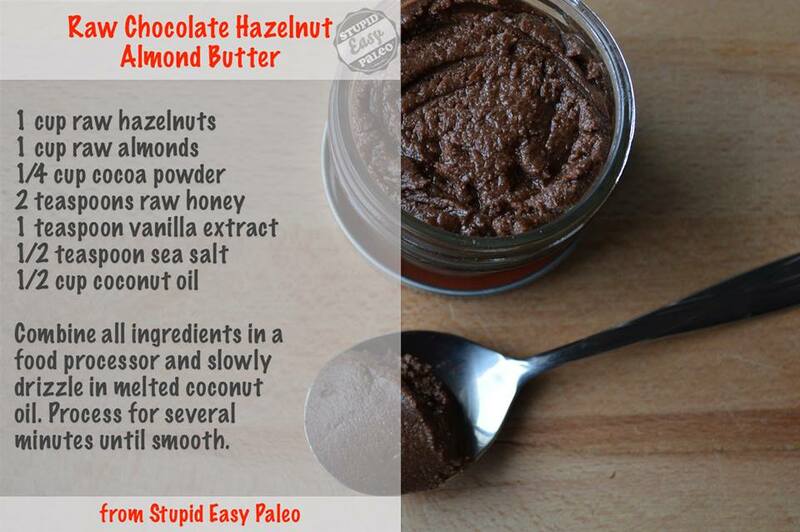 Chocolate Hazelnut Almond Butter is my healthy alternative to a popular spread that's got a lot of sugar. See how easy it is to make! Combine the nuts, cocoa powder, honey, vanilla and sea salt in a food processor. Drizzle in the melted coconut oil and process for several minutes or until smooth. Store in a tightly covered jar. For best results, keep in the refrigerator, though you’ll have to soften it before using. I made a batch of this as soon as I read the email this morning, and it’s a BIG hit with my family! It’s not very sweet, but that’s how we like it now that our sweet-o-meter has been turned down since starting to eat Paleo. 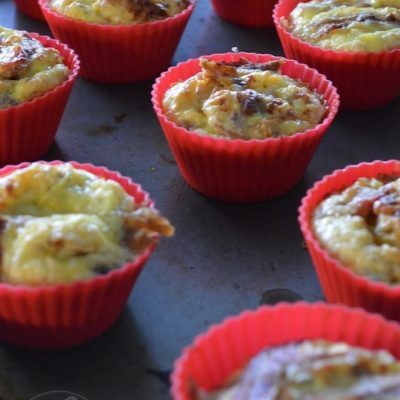 I have to say that your blog has become my top favorite for really tasty, easy, paleo recipes. Thanks! Hi Diane! You put a huge smile on my face this morning. I really appreciate your kind words! Right?! Isn’t it funny how much more sensitive you become to sweeteners and how easy it is to appreciate the natural sweetness in foods? Keep up the great work! I’m wondering what I can substitute for coconut oil, which I cannot have. Maybe hazelnut oil, but reduce the quantity? Hi LaVonne…ah, good question. I added it because the nut butter was too dry and crumbly without it. Try adding a small amount of the oil you’d like and stop when you see that the consistency isn’t too try. 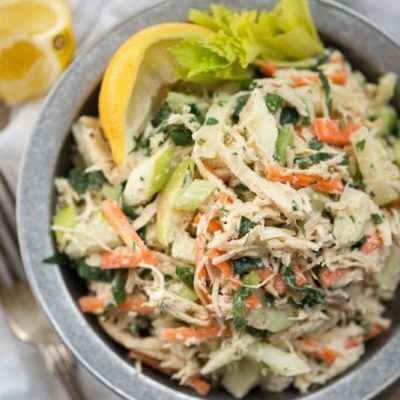 I am so making this for a healthier alternative! My daughter thinks she loves “nutella” and the ingredient list horrifies me! I can’t wait to substitute this recipe for it. Thanks as always for posting your incredible recipes and inspirational ideas and ways to eat real food that tastes great! Hi Deb! Thanks so much for stopping by. Isn’t that Nutella label scary?? So much sugar, too. I hope you like it and thank you so much for your kind words! I made this as soon as I got home from work yesterday. I halved the recipe and used a medjool date instead of the honey. It turned out fantabulous!! Love your date substitution! I tend to use them for things involving sweeteners in a dish! Thanks for checking in, Sarah! Looks great!!! 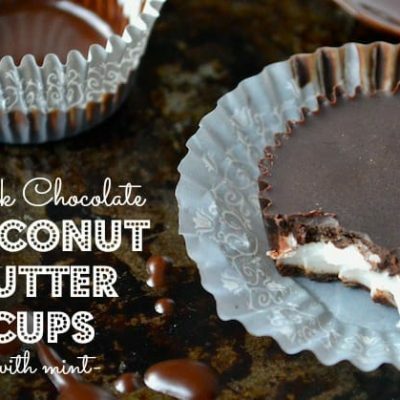 I’ve tried a few different Nutella alternatives, so I’ll have to try this one next!!! If I don’t to almonds do you think a combo of Brazilian and cashew would work to make up for that cup? Just found your site, love everything I see! Hi Erin! I think that nut combo would work just fine. It may not have that same hazelnutty flavor but I bet it comes out absolutely delicious in its own way. Awww thank you for such kind words. I did 1 cup hazelnut and 1 cup cashew, and it turned out great! PERFECT!! 🙂 I’m stoked to hear that. Thanks for writing back, Erin! Just made this and it is delish!! I was in the mood for something a little sweet & this was perfect! I did add a tad more honey to my batch… So good!! Hey Steph, love this stuff. Any ideas how I can make a bar out of it? I love those ” perfect food bars”, but there’re expensive and a little processed. 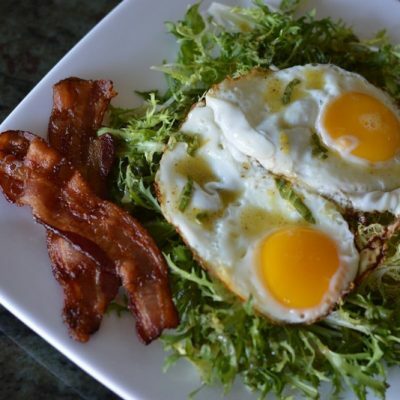 I am so new to all this, but I find your website and post on FB so informative, that you have me hooked on Paleo. I even started to phase out my kitchen and pantry from regular (junk) to the healthy food. Thank you for your time and great recipes. Hi Lina! Wow, hearing from you is exactly the reason I do this every day. I am truly pleased to know that I have made a difference for you 🙂 Have you signed up for my quickstart guide? 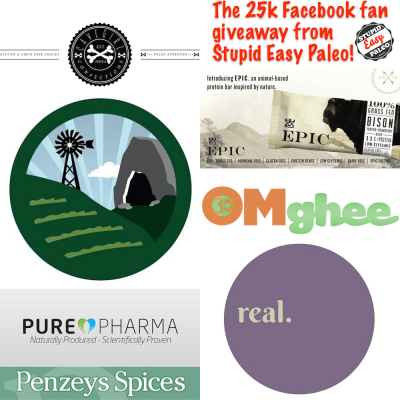 It’s free and will take you through some of the basics of Paleo and Paleo cooking. 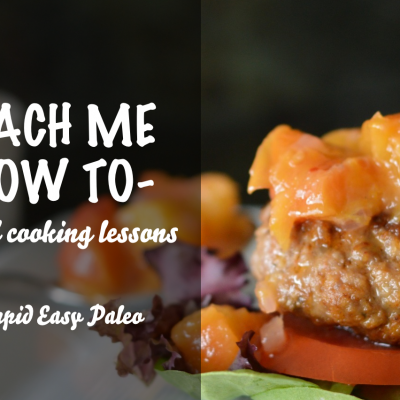 Here’s the link: https://www.stephgaudreau.com/easy-paleo-quickstart-guide/. Thank you so much for stopping by and saying hello! Have a wonderful weekend. 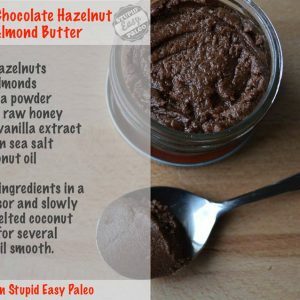 This looks amazing….I really want to try to replace my peanut butter fetish with paleo nut butters!..Question…could I make a plain hazelnut butter with all hazelnuts (2 cups) instead of using almonds…use hazelnut oil instead of coconut oil to “oomph” the hazelnut flavor profile? Thank you for your VERY informative paleo ingredient primers….the peanut information was stellar and answered many of my questions regarding paleo protocol…to pea (nut) or not to pea (nut)! Haha Donna…loved the joke there at the end. I think you could do that, yes…but I might suggest making sure the hazelnuts are skinless which usually means they have to be blanched or roasted. The skin can make it bitter. Course, that means it won’t be raw but if that’s not a concern for you, should be fine. Thanks so much…I’m glad they’re helpful!! Thanks for the rapid reply!!! For all of your “across-the-pond-ers” in Europe (I’m in France)…finding organic hazelnut flour or skinless hazelnuts is quite easy…they are as ubiquitous as their almond cousins here.(and. importantly…in the same price range! )…I imagine, however, that raw would definitely be a better choice…I’ll see if I can track ’em down! How long does the mixture keep? Should it be kept in the refrigerator? I like to keep nut butters in the fridge. It should keep, tightly covered, for at least a couple weeks. I’m totally confused. I just finished reading your article about the downfall of peanuts, due to the fact that they are a legume. Cocoa powder comes from a bean, doesn’t it? Peanuts themselves are often contaminated with aflatoxin which is the concern, not the fact that it’s a legume.